Labradanes may look intimidating because of their size, but they are one of the sweetest and most loving dogs around. These hybrids are like oversized puppies, thanks to their affectionate and playful nature. In this article, let’s get to know this gentle giant and find out if it can be a great addition to your family. Great Dane Labs are playful and energetic. The Lab Great Dane mix get along well with (almost) everyone. What does a Great Dane and Lab mix look like? A Lab Great Dane mix sheds moderately. Labradanes are smart, but some can be stubborn. All of these sound good! Where can I get a Labradane pup? Is this Great Dane and Labrador Retriever crossbreed for you? A Great Dane and Lab mix or Labradane is a designer dog that is a cross between two favorite big dogs: a Great Dane and a Labrador Retriever. Designer dog breeds became popular during the 1980s when breeders started to intentionally mate two purebred dogs to create healthier offspring. Just like with any other crossbreeds, the best way to get to know the Great Dane Lab mix is through its parent breeds. Great Danes are giant dogs from Germany. They were initially bred to hunt and protect their owners and their owners’ properties. Today, Great Danes are known as one of the gentlest and most affectionate breeds around. They are people lovers, patient with children and eager to please their owners. Labrador Retrievers have been the American Kennel Club’s most popular breed for years. They were bred to help their owners in retrieving game and hunting. Today, Labrador Retrievers are known to be outgoing, friendly, and smart. They are working dogs and help in search and rescue operations and drug and explosive detection. It should not come as a surprise that the Lab Great Dane mix is one of the sweetest dogs, since both its parent breeds are very loving. This hybrid craves human attention and they take every opportunity to show you they love you. You can expect a Labradane to cuddle up when you watch TV or sleep next to you. While its clingy nature is endearing, this breed is prone to having separation anxiety if left alone for too long. If you’re considering the Great Dane and Lab cross as a pet, you might want to check your schedule because you have to make time for this pooch to keep it happy. Labradanes have high energy levels and they love to go for walks, run, and swim. They need moderate exercise daily to keep them healthy and happy. A Labradane is required to have at least 30 minutes of physical activity every day. These dogs need their exercise to put their energy to good use and maintain a healthy weight. Great Dane and Labrador Retriever mix puppies tend to be bouncy because they can get overly excited when at play, but this can be taken care of by proper training. Both Great Danes and Labrador Retrievers are great with children and it’s not surprising that this crossbreed has inherited this endearing trait. Labradanes are patient with kids and other pet dogs, making them a good addition to the family. A bit of caution, though: they can be over-enthusiastic and might unintentionally hurt small children when playing. It’s always best to keep an eye on these dogs every time they are with small children. While Great Dane and Lab mixes are friendly with the people and animals they know, they have an instinct to protect their owners. These dogs are usually wary of strangers, but they will not bark unless they perceive a threat. Even if your Labradane can be protective, they are not ideal guard dogs. They are naturally sweet and they just happens to scare strangers off because of their size. Due to Labradanes’ size, they need space to move around and they might not be ideal pets for apartment dwellers. A full grown Great Dane Lab mix can grow up to 24 to 30 inches (61 to 76 cm) in height and weigh up to 100 to 180 lbs (45 to 82 kg). This breed is classified between a large to giant dog. The size of this breed is at times described as smaller Great Danes, but bigger Labrador Retrievers. Great Dane and Lab mix puppies experience fastest growth in the first 6 months and stop growing at 12-18 months. These crossbreeds literally grow up fast, and the rate at which your puppy’s body changes may surprise you. It may be difficult to predict how a crossbreed would look as they can take physical attributes from either parent. In general, this hybrid has a muscular body with a broad head. They have also inherited their floppy ears and long, curled tail from their parents. What’s really prominent about this breed is its imposing size. They have short, thick and glossy coats that shed moderately. A Labradane may have a coat in shades of black, brindle, chocolate, brown, fawn, white, cream, merle, and golden. Keep the Great Dane Lab mix’s shedding under control by brushing its coat regularly. Twice-a-week brushing is enough to keep their coats looking healthy during non-shedding season. Brushing requirements increase to daily when these dogs’ shedding season starts. Brush in the direction in which the coat grows. Be gentle to avoid hurting your dog. Instead of looking at it as a task, think of it as an experience where you and your pet can bond. Give your Labradane a treat after grooming so he behaves at the next grooming session. Like its parents, the Great Dane and Lab mix doesn’t need to be bathed often. Bathing this dog too often will strip its coat of natural oils and result in dry skin and allergies. A bath every month or two (or when your dog gets really dirty) works best for this crossbreed. The floppy ears of the Labradane will also need weekly checking and cleaning. Use cotton balls and a vet-approved cleanser to remove debris and wax buildup from your dog’s ears. Make sure the ears are completely dry to prevent the spread of bacterial. Great Danes and Labrador Retrievers are known as working dogs, which means that they are smart and capable of carrying out specific tasks such as guarding property or pulling sleds. Like its parent breeds, the Labradane is quick to pick up on commands. 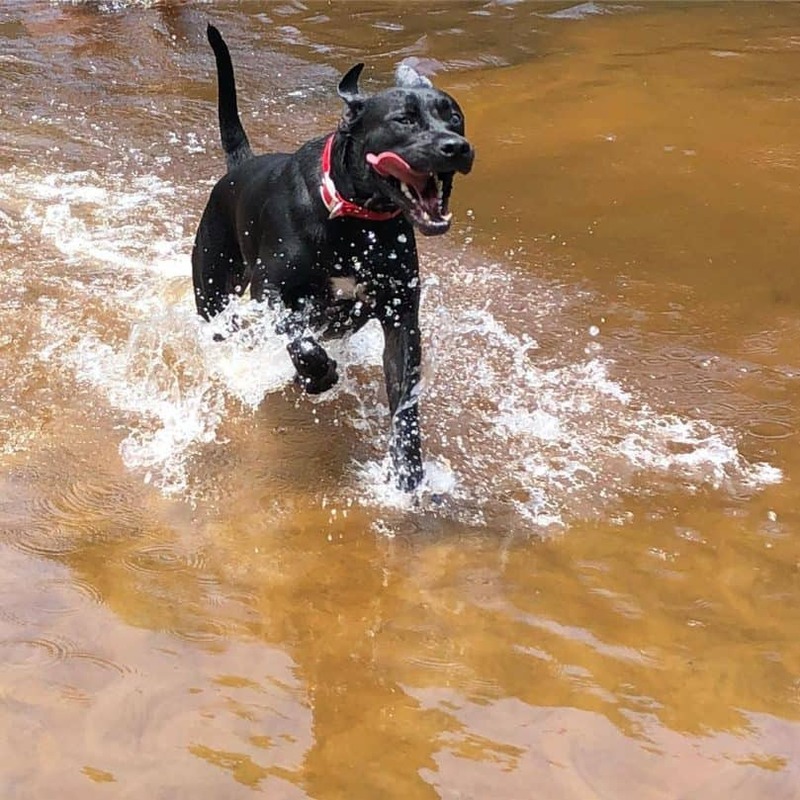 Generally, the Lab Great Dane mix is easy to train because of its intelligence and eager-to-please attitude, which it mostly inherits from its Labrador Retriever side. But you might also encounter dogs who are a little more stubborn in following commands. Due to their size, training these puppies early is necessary. It’s easier to control them when they are smaller. Training will also ensure that Great Dane Lab mix puppies will grow up to be well-behaved giant dogs. Socialization – Labradanes can be protective and will be suspicious of strangers. While these dogs are puppies, you will need to socialize them with people or other animals that they would need to get along with. Crate training – Your Great Dane and Labrador mix cannot be left to roam around your home when you’re away or when you’re asleep. This is dangerous for your dog, especially because of its size. Basic obedience training – Here’s where you teach your dog basic commands such as sit, down, come, drop,and stop so you can control their behavior when needed. This breed can get over-excited so you also need to train him how to express its enthusiasm appropriately. You can take advantage of your Labradane pup’s eager-to-please nature. They would take opportunities to make you happy in training so they would listen well and follow instructions. Positive reinforcement such as treats and praise also go a long way in helping good behavior stick. Remember, these dogs are sensitive to your attitude and the tone of your voice. Yelling at your Great Dane and Lab mix will not yield positive results and might hurt his feelings. You don’t want him to feel less affection towards you. Understandably, the Great Dane and Lab hybrid to have a healthy appetite because of its size. They also have a tendency to overeat just like their Labrador Retriever parent. Feed your Labradane 4.5 cups to 6 cups of dry dog food, divided into three meals a day. Expect to spend about $100 monthly on premium dry dog food or $80 monthly on standard dry dog food. It is important that Great Dane and Labrador mix puppies don’t eat more than the recommended amount. Both parent breeds are prone to obesity, which can result in other serious health problems. Dog food for giant breeds like Great Danes may also be the best food for the Great Dane Lab mix, since these two dogs are around the same size and will share similar nutritional needs. The right kibble will give your pup healthier skin, a shinier coat, and higher energy levels. It would be better to consult your vet to prescribe a specific diet for your beloved canine. Please note that as your Great Dane and Lab mix puppy grows, it would have different needs for its growing body and activity levels. A Labradane’s average life expectancy is 8 to 12 years. Like with any crossbreed, we have to check its parent breeds to see the potential health issues it may inherit. Elbow and Hip Dysplasia – this is a condition that usually affects large dog breeds. It occurs when the ball and socket joint is malformed, so that instead of sliding smoothly, the ball and its socket do not meet properly and grind against one another. This condition can cause great pain to your Great Dane and Labrador Retriever mix. Obesity – Labradors love to eat and the Labradane can inherit this hearty appetite. It is best to observe portion control when feeding your Great Dane Lab mix. Its daily exercise should also be helpful in keeping excess weight off this dog. Panosteitis – this is bone inflammation that is common in puppies with long legs due to rapid growth of bones. Cardiomyopathy – is a heart condition Great Danes suffer from. It is a disease of the heart muscle resulting in an enlarged heart. Your Great Dane and Lab mix should have a heart checkup at least once a year. As a deep-chested breed, the Labradane is also prone to bloat or gastric dilitation-vovulus (GDV). There are several theories about the cause of bloat. The most common theory is that it happens when a dog overeats or eats too quickly. Gas buildup causes the stomach to inflate like a large balloon, and the stomach becomes overstretched. The heart and the stomach don’t get enough blood, and stomach tissue dies. This is why bloat is often a fatal condition. One of the easiest ways to prevent bloat is to keep your dog from physically rigorous activities right after meals. Feeding your dog large kibble (which he won’t be able to gobble down quickly) will also help minimize the risk of this condition. This list of health issues might look overwhelming and may make you think twice about getting yourself a Labradane. But advocates of designer dog breeds say that hybrids are much healthier than purebred dogs due to genetic diversity. This crossbreed may or may not inherit these illnesses, but the key to having a healthy Great Dane and Lab mix lies in the care and attention you give to your pooch. Visits to the vet to have health checks are strongly advised to prevent any serious issues from developing. Giving your pet a proper diet and sufficient exercise is important as well. A Great Dane Lab mix puppy is priced at $250 to $550 You can also get your Great Dane and Lab mix from rescue or a dog who is for adoption and is looking for a new home. With the potential health issues of this dog’s parent breeds, it’s essential that you choose a reputable breeder. It will be heartbreaking if you take home a puppy and find out that it has a chronic illness. Responsible breeders will have done genetic testing to see if your pup’s parents are carriers of certain conditions. Genetic tests may be more expensive, but they’ll save you money on the costs of medical care for your Great Dane and Labrador mix. Plus, they’ll save you from the sadness of your beloved pet dying too young. 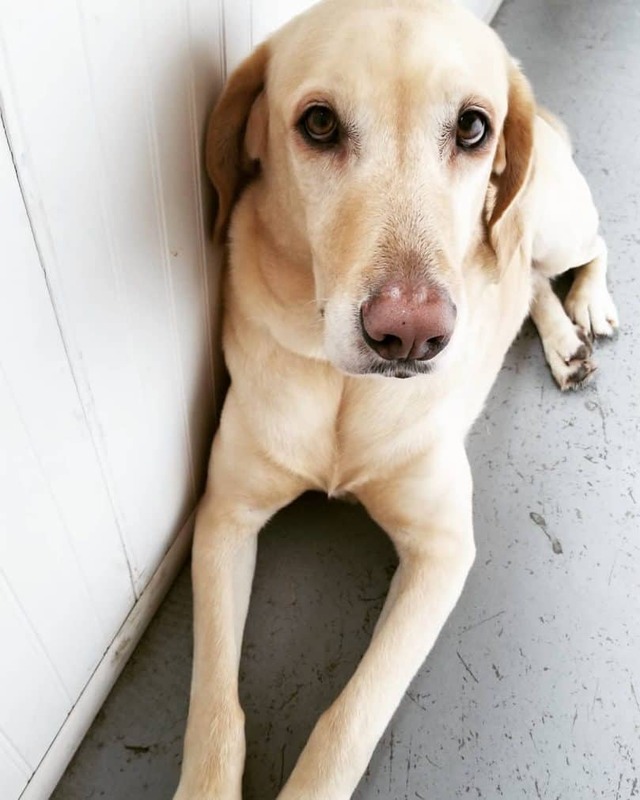 It may not be easy finding a breeder that focuses on Labradanes, so you can check breeders of Great Danes and Labrador Retrievers and go from there. Having a dog is a commitment, but a giant dog requires an even bigger commitment. 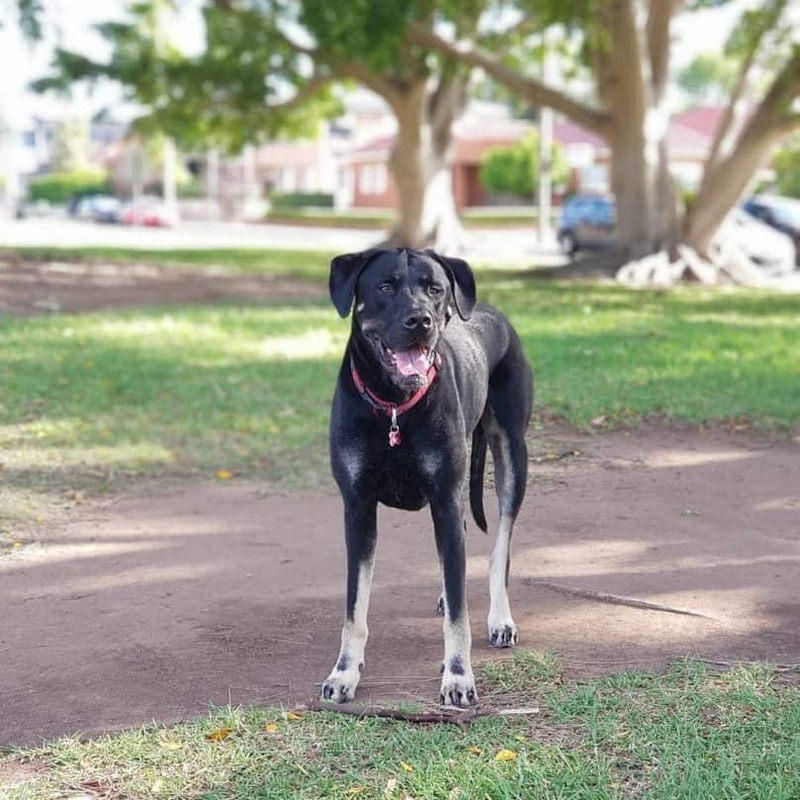 If you are someone who can dedicate affection and attention to the Great Dane and Labrador Retriever mix, then this smart and loving breed is for you. You also need to spend plenty of time training and socializing the Labradane, especially when it’s still a puppy. 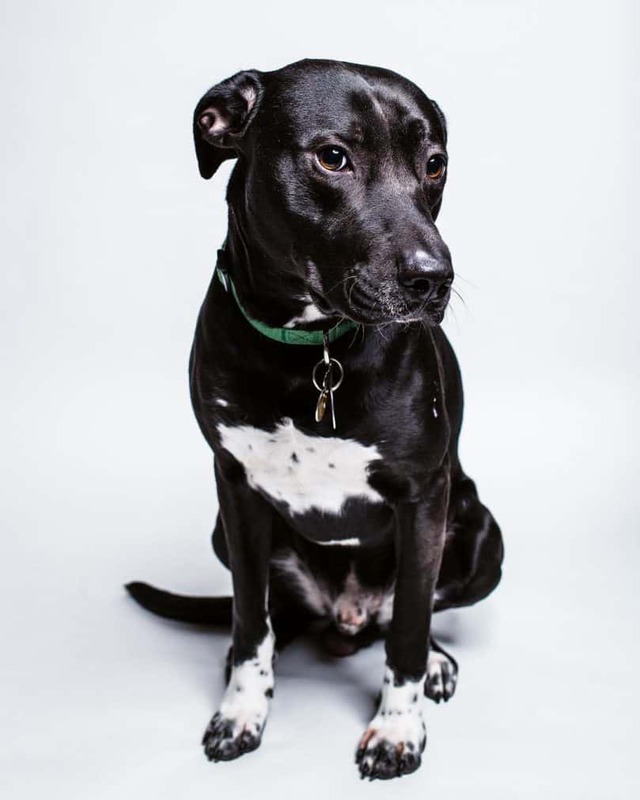 A properly trained Lab Great Dane mix gets along well with other people and pets. 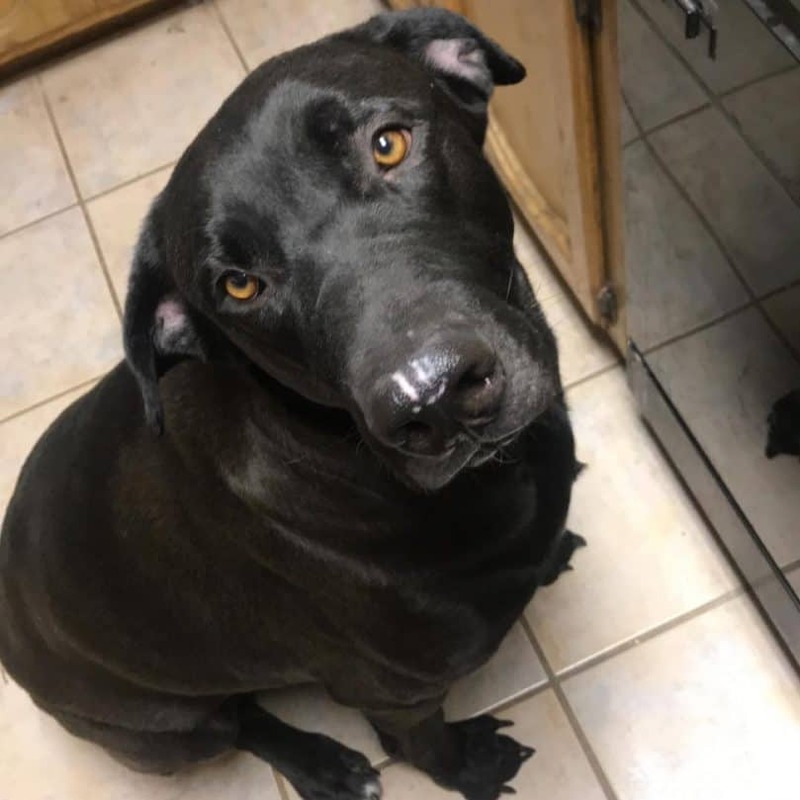 Do you own a Great Dane and Labrador mix? Tell us about your beloved dog in the comments section!